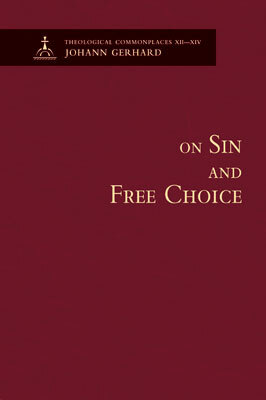 The following excerpts are taken from the soon-to-be-released volume On Sin and Free Choice, which includes Gerhard’s discussion of original sin, actual sins, and freedom of choice (“that Is, on the human powers still left after the fall”). The subject of original sin is the whole man. § 95. Now that we have explained the nature of original sin, let us take a look at the subject [affected by] this disease. This consideration contributes very much to the understanding of its severity. Therefore we say that man is the subject of original sin not only in a part of himself but also completely in soul and body, with his individual members and powers. We confirm this with the following arguments. (I) Scripture says that the whole man is “conceived and born in sins” (Ps. 51:5), “from an unclean seed” (Job 14:4), and that he is “flesh” (John 3:). (II) It also shows this same thing through his individual parts. Regarding the mind and intellect of man, it says that man is “blind,” that he is “darkness,” that he “cannot understand the things which are of the Spirit of God” (Eph. 5:8; 1 Cor. 2:14). Regarding his will and heart, it says that “every imagination of the heart is evil from childhood” (Gen. 6:5; 8:21), that the “heart is corrupt and inscrutable” (Jer. 17:9), that man is “a slave to sin” (John 8:34), that he is “dead in his sins” (Eph. 2:1). Regarding his body and members, it says that his eyes and right hand cause man to stumble (Matt. 5:29–30), that sin resides in “our mortal body” (Rom. 6:12), and in Rom. 3:13ff. almost every member of man is listed. (III) Since habits and privations involve the same subject, it is thus possible to conclude what the subject of original sin is: from the subject of original righteousness, whose place it took. Original righteousness was not merely a righteous temperament of the body but was especially an uprightness of all the powers of the soul. Therefore original sin is not merely a sickly quality of the body. Original righteousness included the soundness and conformity of the powers of man with both tables of the Decalogue, and it was located not merely in exterior actions or the inferior powers, but its seat was the entire soul of man with all its strengths and powers. Therefore original sin is not only the disobedience of the sensitive appetite, nor is its seat only in the inferior powers of the soul. Rather, this spiritual leprosy pervades the entire man so that “from the sole of the foot to the top of the head there is no soundness in him” (Isa. 1:6). (IV) The renewal of man reveals the same thing. For since it is necessary for people to be renewed by the Holy Spirit in soul and body, surely soul and body have been corrupted by original sin. In Eph. 4:23 the devout are “renewed in the spirit of their minds”; in Rom. 12:2 they are reformed by “a newness of their mind,” so that, Col. 3:2, “they know the things which are above.” According to 2 Cor. 7:1, “they cleanse themselves of every defilement of flesh and spirit, perfecting their sanctification in the fear of God.” Therefore they have been corrupted throughout their nature, in flesh and spirit. There is a memorable example in Dio [Cassius] in his life of Nero [Vita Neronis], who, fleeing after his mother was killed, trembled at everything, [even] if a cat would meow a little or a hen cluck or a shrub move. (III) A curvature, obliquity, and filthiness of the soul. For as a man who turns his face away from the sun remains turned away until he again turns his face toward the same sun, and as a finger deliberately bent retains that curvature until it is again straightened by a contrary action, so also the will which departs from God through an act of sin remains in that departure until it again comes back to God through repentance. (IV) Guilt, which some claim is of two kinds: the guilt of fault (which is the worthiness of hatred, the unworthiness of grace, and the merit of punishment) and the guilt of punishment (which is the arrangement of or obligation of punishment). For even though a corrupt action may pass after it has been committed, yet the iniquity of the deed remains in the sight of God, is carefully observed, and is written in a book, so to speak. Hence the sighs of the devout: “No more remember my iniquities; erase my sins,” etc. [cf. Ps. 25:7; 51:1]. Because sin is a disordered act, it is obvious that whoever sins acts contrary to an order, and thus the consequence is that one is pushed away from the order itself, and the pushing away is the punishment. Whence according to the three orders to which the human will is subject, man can be punished with three punishments. (1) Human nature is subject to the order of its own reason; (2) to the order of the governing, exterior man; (3) to the universal order of divine governance. But each of these orders is perverted by sin, and thus man incurs threefold punishment: one from himself, which is the prick of conscience; the second, from man; and the third, from God. The corruption of the mind after the fall. Therefore, even though the mind of man shapes thoughts which, in its opinion, are excellent enough, nevertheless they are vain in the judgment of God. Gen. [6:5]: “Every imagination of the heart” (even those thoughts which are formed with very great care and the loftiest wisdom) “is only evil every day.” Consequently, Matt. 16:17: “Flesh and blood has not revealed to us the saving knowledge of God”; that is, as man is born into the world from the flesh and blood of corrupt parents, he cannot aspire to this knowledge with his innate abilities because, 1 Cor. 2:14: “The soulish man does not perceive those things which are of the Spirit of God, for they are folly to him, and he cannot understand them.” Here the “soulish man” is the same as the “flesh and blood” in Christ’s statement, that is, from the sort of man who, without the recalling [force] of the Spirit, has been endowed solely with the powers and faculties of [human] nature. Paul removes both the knowledge and the understanding of those things which are of the Spirit, so that [the soulish man] is able neither to understand them nor to embrace them with a strong or weak assent. In fact, not only the “knowledge” but even the “power of knowledge,” that active “receiving” power, is taken away from him, and therefore also the “mind of the flesh” is removed, not only the inclination but also the wisdom of the flesh (as the Vulgate version has it). The most excellent thoughts and efforts of the mind in the carnal man (or the not yet regenerate person who is still under the old flesh) “are enmity against God” (Rom. 8:7). Here, in the substantive [verb], there is a great emphasis, because not only is our mind unfriendly toward God, but it also is actually enmity against God, so that “every thought must be made captive under obedience to Christ” (2 Cor. 10:5). Therefore we conclude with the words of the apostle, 2 Cor. 3:5: “We are not sufficient of ourselves to think that anything is coming from us, but our sufficiency is from God.” Here the prepositions ἀπό [“from”] and ἐξ [“from”] must be observed, by which it is indicated that within our powers there exists no capability of thinking anything good; but now, thinking is much less than assenting, considering, firmly proposing for oneself, etc. Footnotes have not been included. From On Sin and Free Choice, pages 62, 112–13, 233–34. English translation © 2014 Concordia Publishing House. All rights reserved. To order On Sin and Free Choice, please contact CPH at 800-325-3040 or visit www.cph.org.